Summary: This splendid walk of just over 12 miles was a real challenge as it was my first fell walk of 2011, a year for great walks and great adventures including my most challenging walk ever, the 1,120 mile walk of Great Britain from Cape Wrath in north-west Scotland to The Lizard in south-west England. 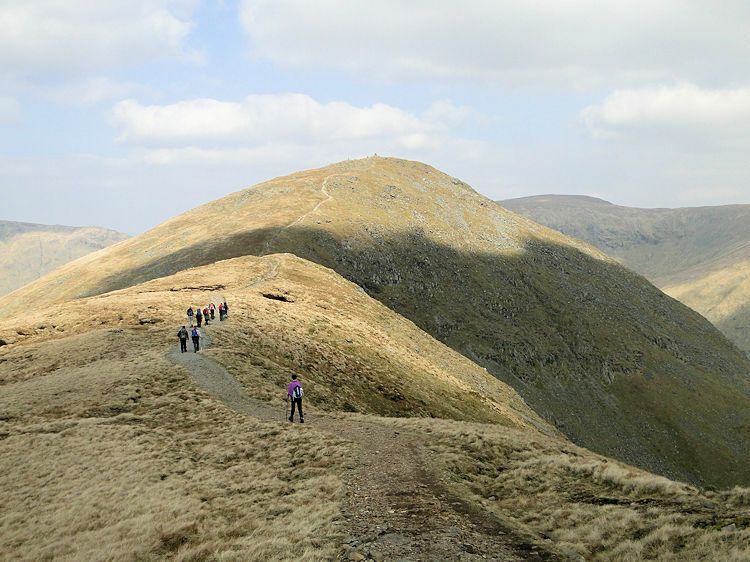 As a starter to the walking season the Kentmere Round, or Kentmere Seven as I have called it (because of the seven Wainwright Fells encountered) was a true test of my fitness and it did catch me out as before halfway I suffered cramps. Not withstanding the discomfort the walk was absolutely stunning. I thoroughly enjoyed the ascent to the west ridge and in particular the section from Yoke to High Street, a veritable roller coaster over Ill Bell and Frostwick. 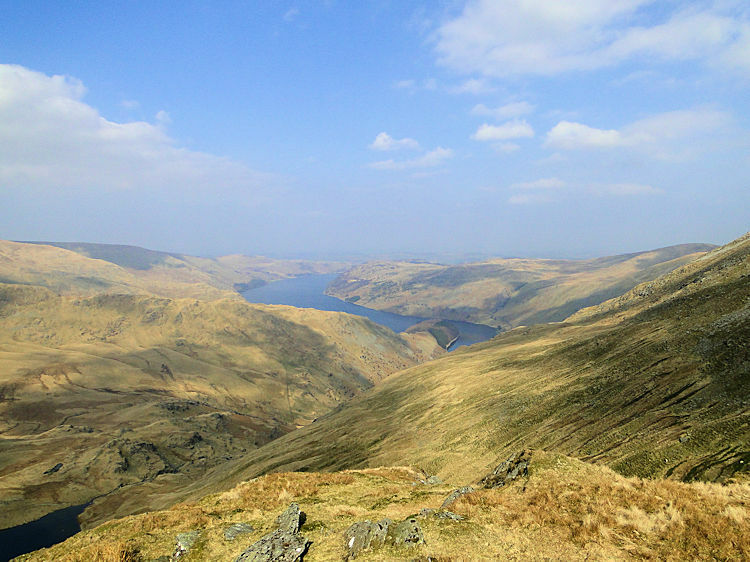 Then after using High Street as a link between the two flanks of Kentmere I enjoyed a wonderful panoramic view from Mardale Ill Bell before walking to Harter Fell, my 100th Wainwright Fell. 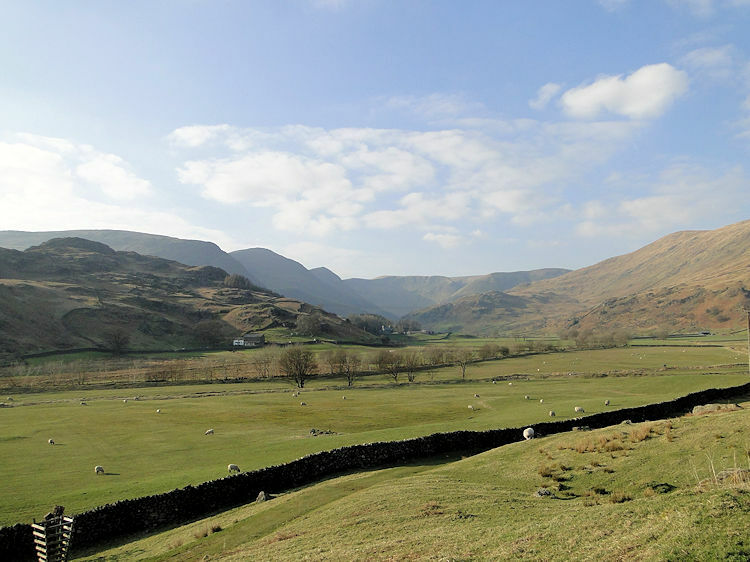 After the glory of reaching my century I bounded over lush high ground to Kentmere Pike and Shipman Knotts before leaving the heights and dropping back into Kentmere. 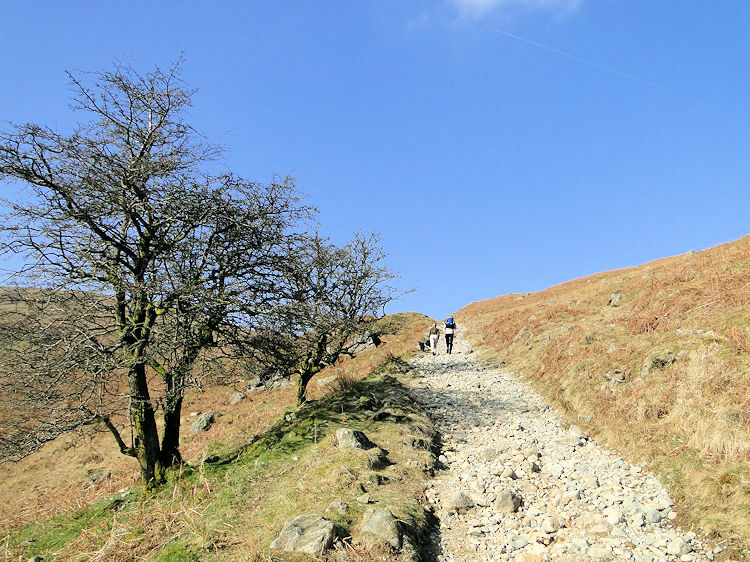 There is no doubt about it, the Kentmere Horseshoe walk is an underrated classic. The Walk: It was a spectacular morning; one of the first days of Spring and the sky above was full of brilliant blue. After a winter which had been harsh before the turn of the year and drab ever since I had been waiting for this day, a perfect Spring day with promises of lots of sunshine and temperature in the heady region of 18oC, the first sign of the breaking walking season. And true to the weather forecast it was a splendid journey which I made from Harrogate to Kendal for breakfast, stocking up on energy before making the short haul from the county town of Cumbria to the valley of Kentmere. I arrived in Kentmere and looked for somewhere to park. The lower part of the villager offered no opportunity so I searched higher up and headed to the church. Fortunately there was a parking area near the church and I took a convenient spot next to the village phone box. Once parked I couldn't wait to set off on the walk so I hurriedly donned my walking gear and collected my supplies for the rucksack before locking the car and bounding up the road in a direction due west first on the road which soon came to an end and then on a marked path to Crabtree Brow. Before I took on the climb though I stopped to seek out Badger Rock, a huge boulder stood alone in the highest placed field on the west edge of the village. I could make out the badger reference as the boulder had a bearded line of growth on the bare rock resembling the stripe of a Badger's face. 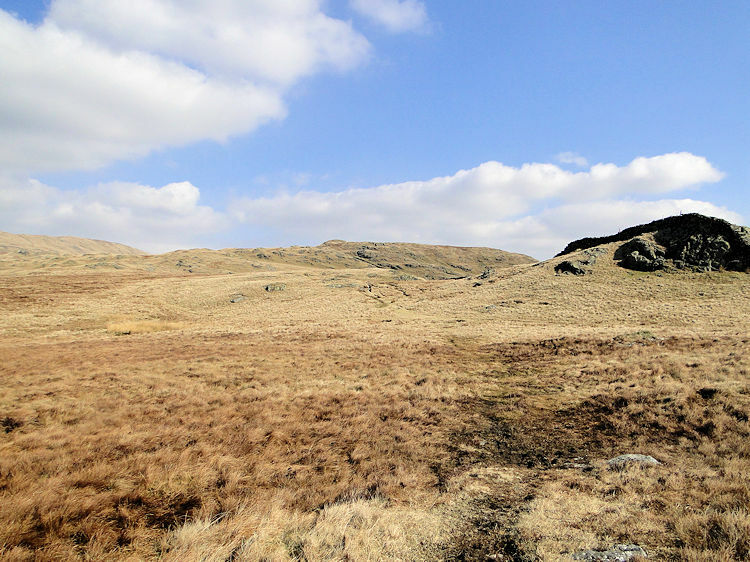 I was soon out of habitation and on the quiet climb past Crabtree Brow toward Garburn Pass which would lead me onto the west ridge of the Kentmere Horseshoe. (Note I have titled my walk the Kentmere 7 as I plotted my route to seven Wainwright Fells which surround Kentmere Valley) On my climb to the ridge I often paused, first for breath as this was my first real ascent of the year and secondly to drink in the views which improved with every step upwards. The view to my right was best with Ewe Crags and then Buck Crag offering interesting inspection of their interesting rock outcrops and weird shapes. To my left the Wainwright Fell of Sallows offered a less interesting view of a rounded grassed hill, a Wainwright Fell which was close enough to capture but not on my itinerary for today. It would have meant turning south at Garburn Nook. I turned north. At Garburn Nook I took a longer break, the heat of the day was rising, even in March it was hot and I had walked in full sun throughout the ascent to the south end of the west ridge. I needed a drink and took it before proceeding due north towards my first Wainwright Mountain of the day. My target was Yoke the least distinct of three mountains on the ridge, but before I could focus my attention on it I was distracted by a fly past as two airplanes flew straight over me as they jetted from the Kentmere valley and over the ridge toward Windermere. As luck would have it I had been filming the view just as they appeared and I caught them on camera which was very unusual, I always seem to miss such instances. I continued on in the marvellous warm weather and walked in a T Shirt which was all I would need to wear all day. At over 700 metres up in March it was simply fantastic, I am often clothed more in midsummer. As I neared Yoke I became aware that the local fells were no longer exclusive to me. I noticed three separate groups of couples climbing the higher reaches of Yoke and immediately ahead of me there was a group of around 10 walkers whom I closed on during my ascent. 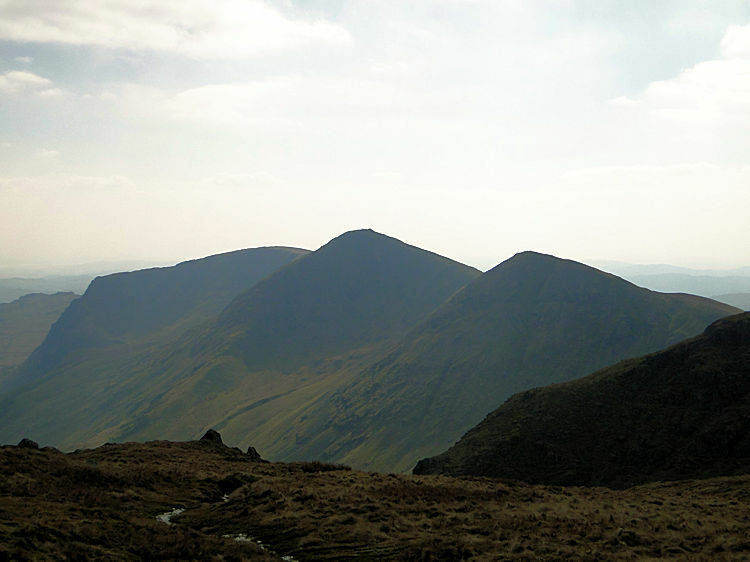 Without really noticing I was on top of the first Wainwright of the day, Yoke had been reached. The group of walkers had stopped for a rest so I moved ahead of them but not for long. Soon I was stopped in my tracks. This was my first real mountain walk of the year and the climb to Yoke had caught me out for I suddenly felt cramp setting into both my calves. It was becoming uncomfortable to walk and so I decided to take a break myself at the next summit, the top of Ill Bell, a magnificent conical topped mountain. 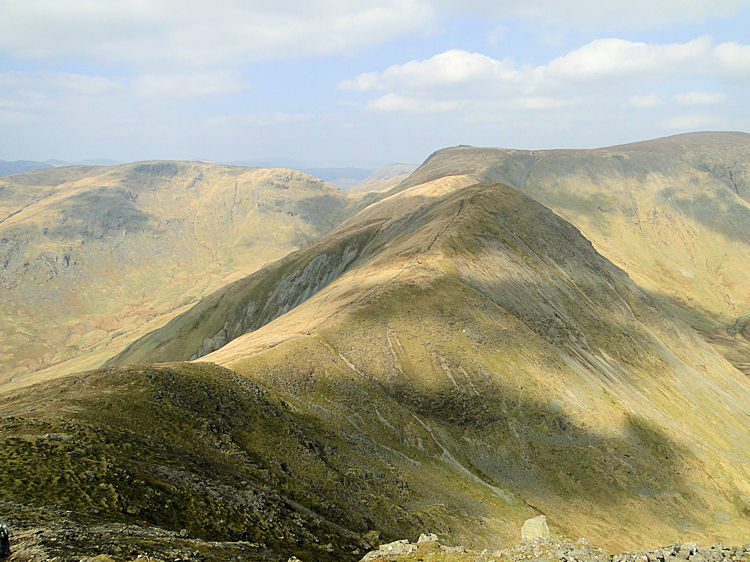 Indeed Wainwright gave Ill Bell accolade as "a graceful cone" He also said the ridge on which Ill Bell is centered "is probably the most popular fell walk east of Kirkstone" The ridge and Ill Bell's wonderful shape and presence was in itself an invite to stop. The cramp in my calves made it a necessity. At least my unscheduled rest break was on a magnificent mountain with beauty of its own and more to offer besides with wide ranging views of many of the Lake District's fabulous peaks in the west including Bowfell and the Scafells and one of the best views of Windermere I have ever seen. It was therapy for the eyes. With my enforced rest I also drank in some liquid to put some vitality back into my legs. 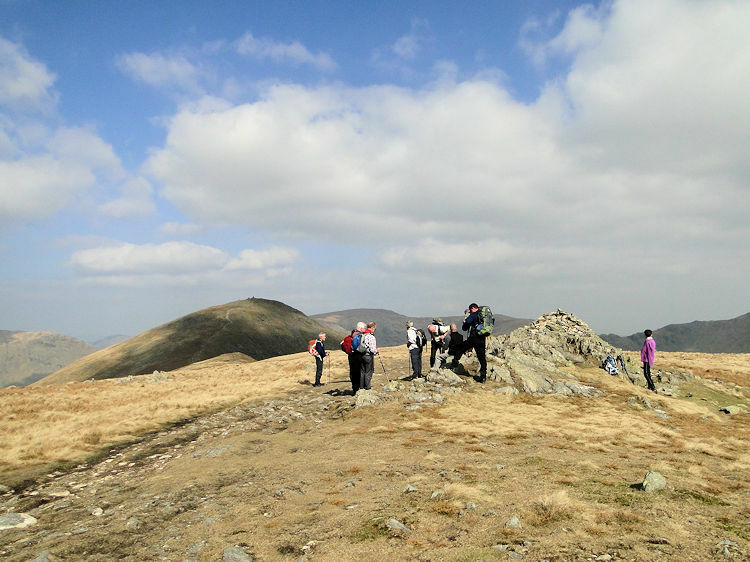 During my refreshment I reacquainted with the walkers I had met on Yoke and we got chatting. They were the Stone Ramblers from Staffordshire and we had a good chat about the joy of being up on the fells in such remarkable weather during March. We all felt good about that and after the pleasantries they went onwards toward Frostwick, also my next target. I got up to follow them and still feeling the stiffness I gingerly made my way from the summit on a quite steep descent onto the band between Ill Bell and Frostwick. As I did so I stumbled and fell on a long angled rock, landing with force on my back and right arm which I scuffed pretty badly. With luck my rucksack took the full force on my back and I suffered not However, in wearing a T Shirt my arm was unprotected and was quite grazed. As I write this report three days later the arm looks a right picture with two round patches of abrasion but the pain is gone, bar a little tightness. I was really lucky, it could so easily have been worse and I took precise care on the remainder of the steep descent and until my calves had eased to make walking easier. Having completed the descent from Ill Bell I undertook the short ascent to Frostwick which is almost identical in shape to Ill Bell, albeit a junior version and 37 metres lower. A little behind my schedule I paid the summit of Frostwick a cursory respect before continuing on to the famous broad sweeping ridge of High Street, once a Roman Road and once a racecourse! 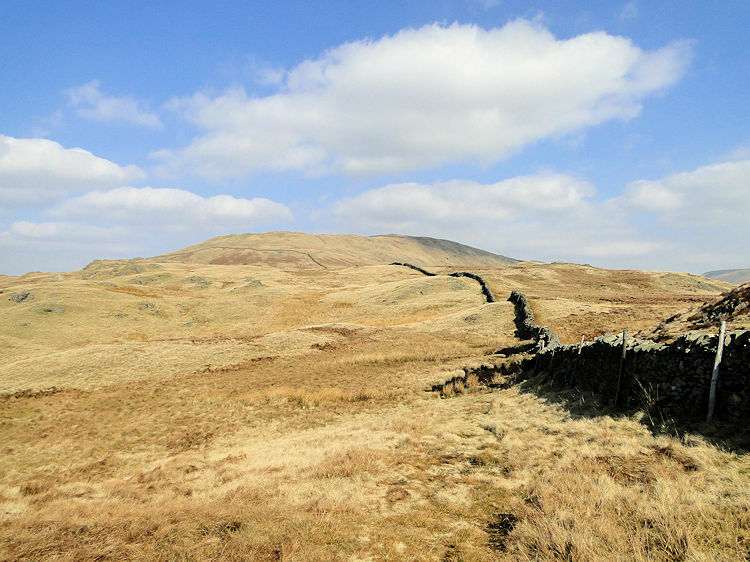 I was in fact bridging the west and eastern ridges of Kentmere by walking on the southern flank of Racecourse Hill, aptly named because earlier Lakelanders used to make the journey up onto the heights to race horses as part of summer fairs held on High Street during the 18th and 19th centuries. There are no fairs held on High Street now but should there still be then today would have been perfect, calm with no wind and set fair. Not at all like my two previous excursions on High Street, both events being in rain with low cloud and no visibility. 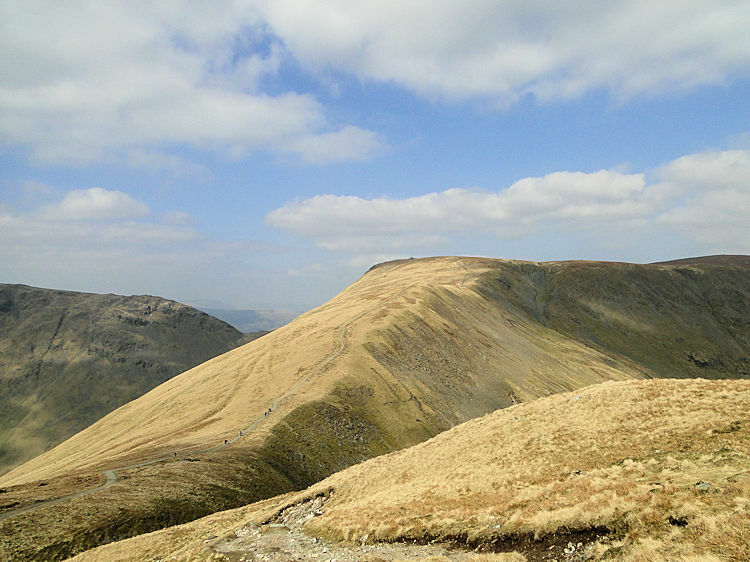 This time I could see High Street in all its natural beauty, a high wide plateau perfect for strolling at height. 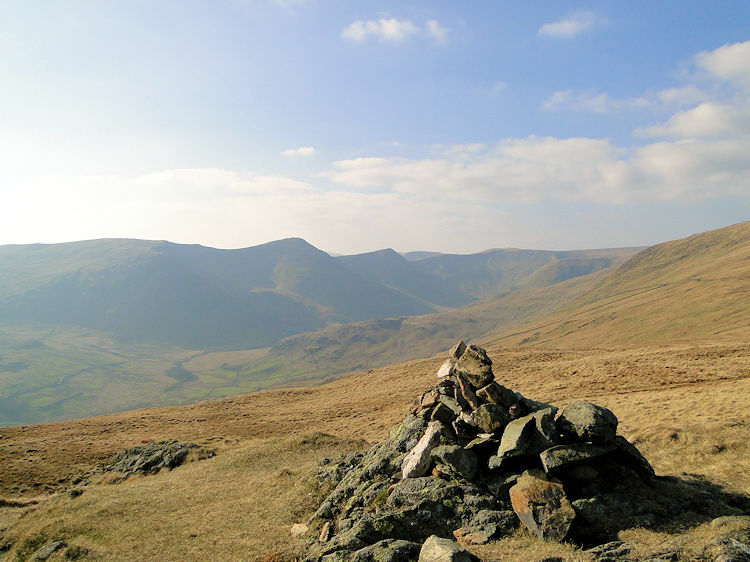 I made my way from High Street to Mardale Ill Bell and took stock for I had reached my 99th of the 214 Wainwright Fells. The next would be my 100th and I looked over to it. Harter Fell was my objective but between the two mountains was Nan Bield Pass, a depression which due to my tiredness looked more like a chasm. In reality it was a descent of 135 metres and an ascent of 153 metres but it seemed a whole lot more. I secretly wished for an imaginary bridge spanning the two but that would have been unfair. To reach my 100th Wainwright Fell I was actually quite pleased I was made to work for it. To be fair, the stretch between Mardale Ill Bell and Harter Fell offered some delightful views as I looked down to Blea Water in the immediate north with Haweswater Reservoir beyond, the Lake District Reservoir known to all those Coast to Coast walkers who have to navigate the length of it on Wainwrights famous Long Distance Path. 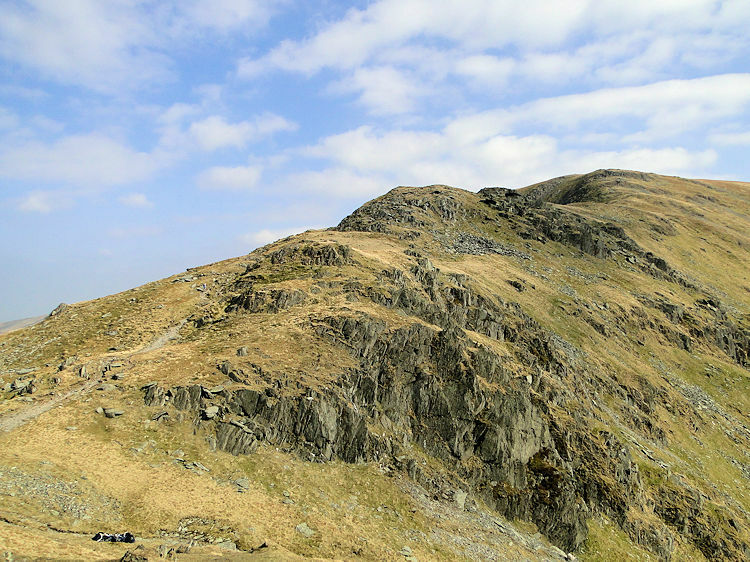 The views and the short breaks I took on the climb to Harter Fell helped me attain my 100th Wainwright. I doubt I will climb them all, it is not a hill-bagging target I aspire to but still I quietly congratulated myself on the achievement. 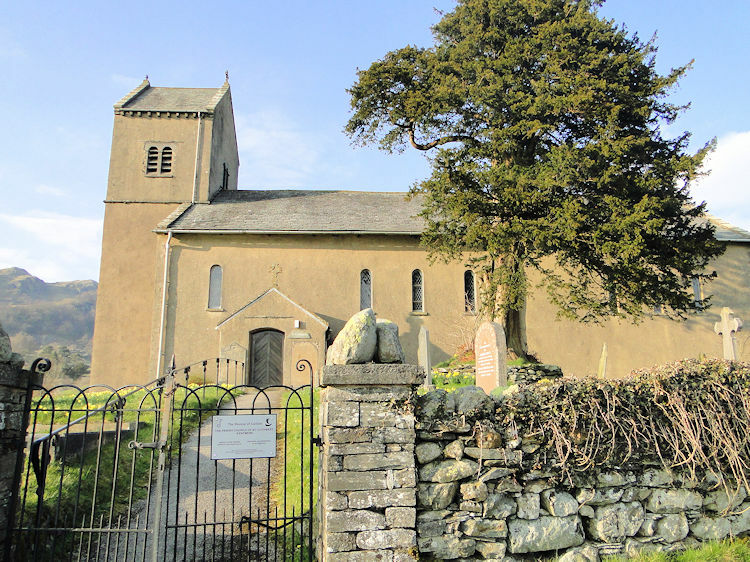 I don't know if it was the achievement of making my Wainwright 100 but I was bounding along now and although my calves were still a little sore they did not stop me speed walking across the lush grass covered fell to Kentmere Pike. Only a brief stop taking pictures of a proud male Skylark stopped my accelerated progress for he stood tall on a fence post and looked toward me. He sung loudly for some time as if I was his chosen audience before flying to ground. 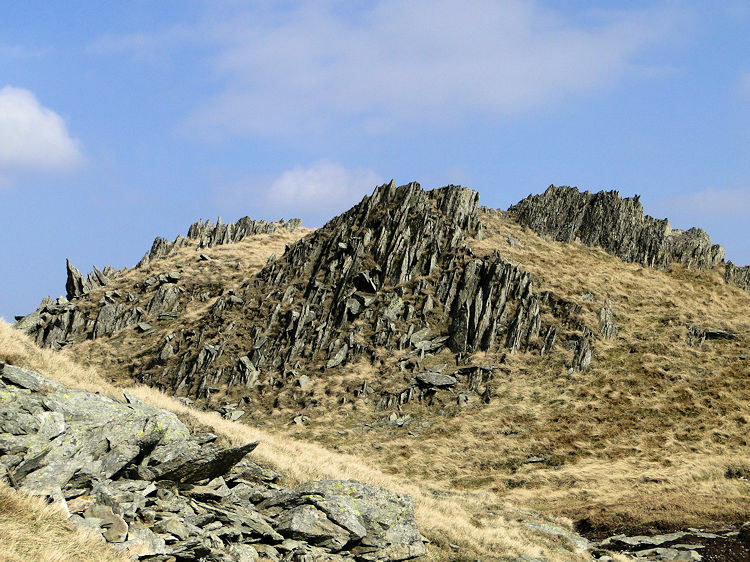 I was thrilled by his spectacular song and bounded off once again to the summit of Kentmere Pike, a bare rounded top which holds little attraction. 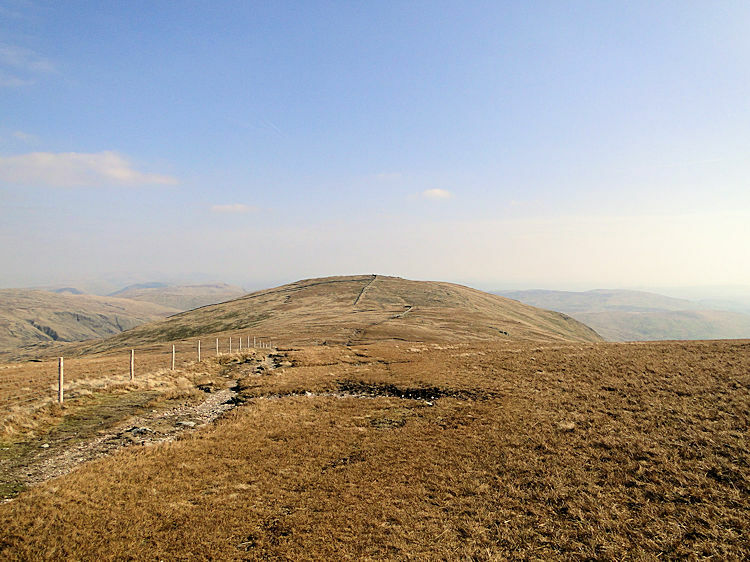 It is the views from the summit to the Pennines in the south east and to Windermere and Morecambe Bay in the south west which demand attention. 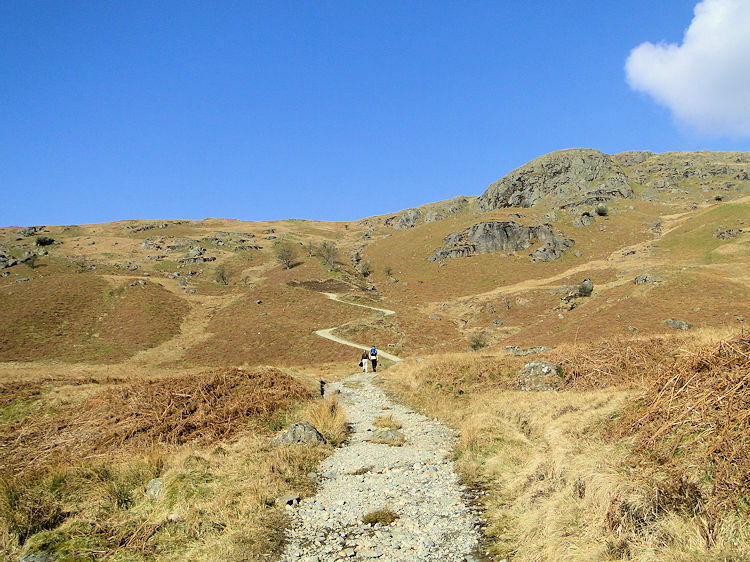 After dwelling on the views for a while longer I made my way southwards on a lovely springy and gradual descent to Shipman Knotts, the seventh and final Wainwright Fell in this walking adventure. Twenty minutes later a full mile had been travelled, by far my fastest pace of the day and I was at Shipman Knotts, a scene of interesting rock outcrops which on another day I could have explored at length. 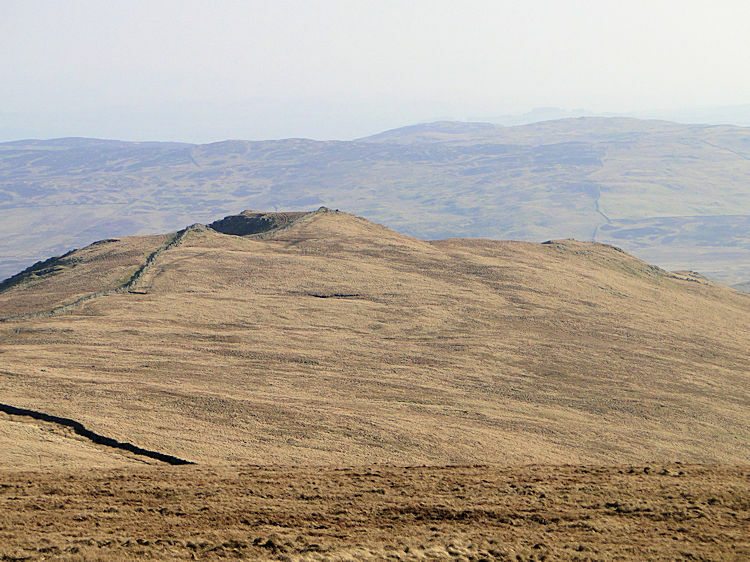 Today Shipman Knotts served as a mere station for plotting my descent back to Kentmere village. 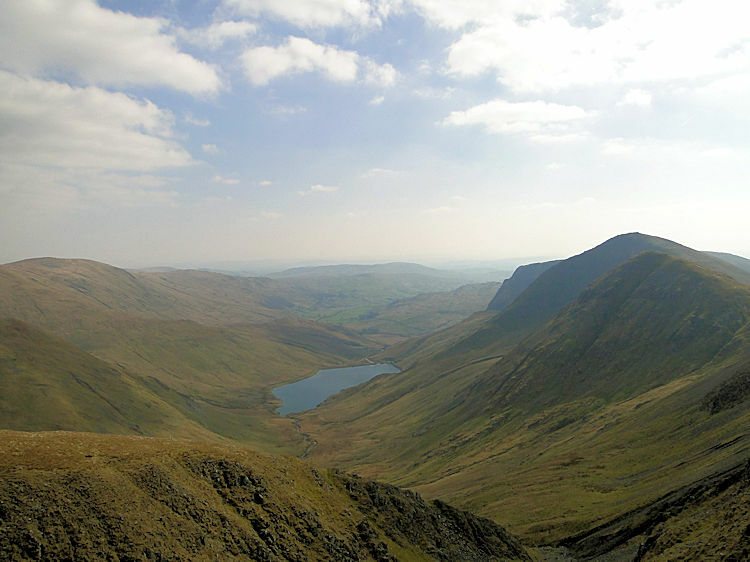 I negotiated my descent from Shipman Knotts to Kentmere by continuing south to Wray Crag and further south to meet the high pass between Kentmere and Longsleddale. Then I turned west onto the bridleway which led me to Stile End, a journey down made delightful by the views directly down to Kentmere village and the valley and the views directly ahead of me to the fabulous west ridge of Yoke, Ill Bell and Frostwick, a ridge walk I shall always treasure. Soon enough I was down into the valley at Stile End from where I joined the High Lane metalled road and tracked north to Brockstones and Hallows Bank before practically about turning to walk south on Low Lane track which I left by climbing a stepped wall and walking across a small field to a footbridge straddling the River Kent. I have to admit I was tired now, I had walked 12 miles and in that over 1,000 metres of ascent but the tiredness was tempered by the pure exhilaration of the walk itself. I mused on my final steps through the village environs and back to the church on a tremendous walk almost accomplished, a walk in brilliant weather completely walked in a T Shirt, a walk on a marvellous ridge, a walk with seven notable Wainwright Fells, a walk with awesome views, views of mountain ranges all the time and views of water, albeit in different locations of both Windermere and of Haweswater. It was a walk when I had close encounters with different flying machines, two man-made and one perfectly natural. And people still ask me what the attraction of walking is? Incredible, the beauty of walking is in itself and in seeing the world we live in at its most natural. We are so lucky to have such diversity of landscape in Great Britain. You know what? I think I'll walk the full length of it.